Knotty Pine V Groove Board or Plank, 3/4" x 5 1/2" with 8 or 16 ft long. Also referred to as 1 x 6. Prices are based on quantities of 1000 feet or less. For quantities over 1,000 ft., contact us for pricing. Length Please select an option 8 ft. 16 ft.
We manufacture a wide variety of Planks and Sheets in different materials for differant applications. We offer advice for those who need help choosing the right one.  Everyone remembers a relaxing summer vacation to a cottage on a lake or winter ski lodge where the natural beauty of Knotty Pine used on the wall took you to another time and place. There is something to be said about the rustic, natural look that only Knotty Pine can provide you, it creates its own mood especially as it mellows and changes color with age. 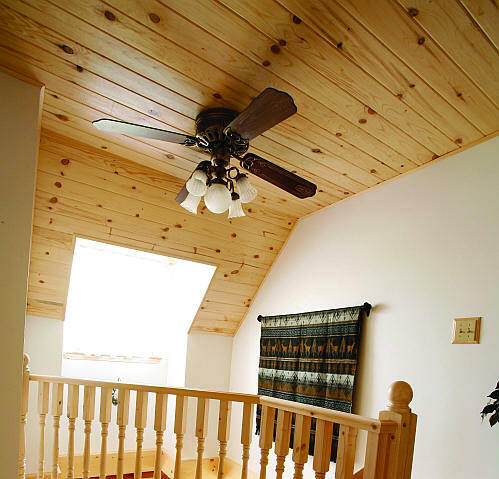 Elite Trimworks has found an easy way for you to incorporate the natural beauty of Knotty Pine into your home d'cor. By using our Knotty Pine Beadboard planks, you can easily give any wall or ceiling that unmistakable charm. Our Pine planks come unfinished and ready to accept any type of stain or varnish. Depending on the finish treatment you can get a variety of looks from the Knotty Pine, it can brighten a room (whitewash) bring nature indoors (unfinished or clear coat varnish) or create a sense of great age (deep, saturated colors). Our Reversible "V" Grove Knotty Pine Planks are easy to order and install. Each plank has a Tongue and Groove edge (as shown in cross-section) which allows each plank to lock into the next. The ends are cut square from the mill, with a "Tongue and Grove" router set, you can machine your own tongue to end match for long runs just like hardwood flooring. Our knotty pine planks are 3/4" thick by 5 1/2" wide, commonly referred to as 1 x 6's and typically 8 feet long. They are available up to 16 ft long and sold in bundles of 304 or 152 pieces. Made from #1 and #2 grade knotty pine with the "V" grove is either 5 1/8" apart or 2 9/16" as shown. These planks are perfect for ceilings, walls and closets. For walls in cottages that are un-heated over the winter, these planks are preferred over drywall since they much easier to install and won't crack in the winter. To calculate material required, you need 2.4 running feet of 1x6 planks to cover 1 square foot. Therefore, take the total area you want to cover, add 10% then multiply by 2.4 and divide by the length of the plank to calculate numbers of planks. For example, if you need to do a wall 8ft x 20 this would be the formula: 8 x 20 = 160 + 10% = 176 sq ft x 2.4 = 422 liner feet divided by 8 ft lengths = 53 planks 8 ft long. Prices are based on quantities of 1000 feet or less. For quantities over 1,000 ft., contact us for pricing. Available in 8 or 16 ft lengths, but keep in mind that UPS or Fedx does not ship trims over 8 ft long. Knotty Pine V Groove Plank, 3/4" x 5 1/2" with 8 / 16 ft long. Each 8 ft. length will give you 3.33 square feet or .31 square meters of coverage. A 16 ft. length yields 6.66 square feet or .62 square meters. Available in 12, 14 or 16 ft lengths, but keep in mind that UPS or Fedx does not ship trims over 8 ft long. Lengths longer than 8 ft. must be shipped by transport, call for pricing. PVC or Vinyl, is a great material to consider for any exterior application. It is a maintenance free product that does not require painting. PVC is a durable material that can be exposed to water and does not deteriorate due to rot or weather. It is also the right choice if you are looking to install in a space where there is a possibility of the trim making contact to the ground or consistently exposed to water. MDF stands for Medium Density Fiberboard and is an engineered wood product ideal for interior applications. MDF offers more stability than solid wood since it does not have a grain and will not expand and contract as much. Painting is a breeze with MDF as it will accept any paint and can be painted any color, most of our interior products are Primed White and are ready to be painted once installed. Hardwood Veneered Sheets, Elite offers Veneered MDF Sheets. MDF is used as the substrate due to its stability and rigidity, it will not bow or bend like actual Hardwood. Using MDF also makes the sheets less expansive than producing Solid Hardwood Planks or Sheets. The furniture grade hardwood veneer we use offers a more consistent grain pattern making it better suited for staining. Knotty Pine is always popular due to its rustic appearance. Our planks are available in a ¾” thickness which makes them an ideal choice when installing onto existing framing with no backing. The Knotty Pine boards are meant to be painted or finished with a Polyurethane Shellac which will protect it for years to come and accentuate the beautiful knots and grain of the Pine. Planks are ideal for situations where you have large areas to cover i.e. ceilings, accent walls or entire rooms floor to ceiling. The planks are made with either Shiplap or Tongue & Groove joints for seamless installation. Planks install much like hardwood flooring and can be staggered so as not to create long unsightly seams. Tongue & Groove planks are typically made using thicker material and can be installed onto a wall without existing drywall directly on to the framing studs. Sheets on the other hand are a good idea if you have a long wall to cover and the seams are not going to be much of an issue. They are also ideal for Cabinet Makers and Furniture Applications where they will be used as backers or on cabinet doors. Our sheets are manufactured in such a way that the sides of the sheets are shiplapped to meet up with the next sheet seamlessly however whenever the two sheets meet up at the end of the bead or groove, you may notice an unsightly seam. Unlike planks that conform to the curvature of the wall, sheets tend to meet up at slightly different angles. Sheets are not as good for ceilings unless you are using them in a Beamed Ceiling application where the seams are not visible. Sheets can be ordered in various joint profiles, sheet sizes and sheet thicknesses. The Beads or Grooves can be ordered in both horizontal or vertical direction. One other thing to keep in mind with sheets is shipping cost. Due to their size, sheets will always be shipped by Transport (Common Carrier) on a skid. As shipping cost is calculated based on the footprint on the truck floor, whether you order one sheet or 50 sheets, the cost is similar. 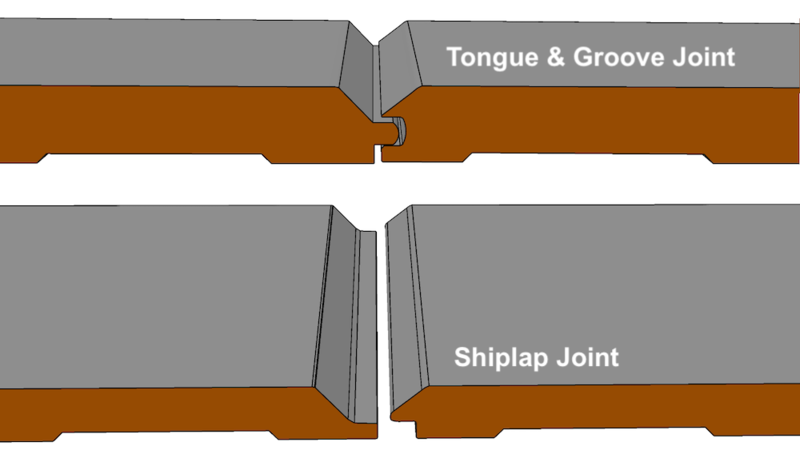 Although our products look similar once installed, Shiplap and Tongue & Groove are two types of joints that vary both in profile shape and in their applications. The shiplap joint offers an overlapping lip which allows the material to expand and contract without any gaps being noticed. These planks are generally thinner and lighter making them better suited for use on a wall that has existing drywall for support so the planks will not bow over time. Our Shiplap planks are only available in MDF. The Tongue & Groove planks are generally thicker and are ideal for situations where no drywall backing is present. These planks can be attached right to the studs to create a strong wall or ceiling. The thickness of the boards and the T&G joint itself make it so it will not bow or sag over time. The Tongue & Groove really shines on exterior applications (PVC only) and can be used as Soffit, Siding or Fascia. The best thing about the PVC product is that is does not require painting however you can paint it if you’d like. Tongue & Groove boards are available in both MDF and PVC. Our plank products are available in lengths of 8, 12 and 16 feet. Shipping of this product in smaller quantities is typically done by UPS, keep in mind that UPS only accepts lengths of up to 8 feet. Longer lengths are shipped using Common Carrier (53’ trailer) and the transport shipping costs need to be taken into consideration. Our sheets can be custom cut with varying bead widths, however, the planks cannot be customized this way. When choosing your bead width, you may want to consider the size of the room. Smaller beads can make your room look too busy if it’s a large area, but they would look great in a smaller room. Bead widths of 2-3” are the most traditional choices. Our beaded planks come with 3 beads that are about 2.7” apart. Larger bead spacing may be more appropriate for a larger room or ceiling application and in this case we would suggest ordering our Custom Beaded Sheets. We offer beaded MDF sheets with either a “W-Bead” or a “Standard Bead”. Please note that our beaded shiplap planks offer deeper beads that requires thicker MDF (or PVC) and the cost of material and shipping can be more as a result. The Beadboard options at big box stores tend to be shallow and cut from thin material in the interest of reducing cost. The V Groove is more traditional and looks more like boards or hardwood flooring than the other options due to the bevel that runs along the side edges of the planks. The Planks can be installed with random end joints at either uniform or staggered intervals like flooring. Painting is a breeze with the V Groove as it tends to be shallow and easy to get paint into the “V” without too much work. Note that deeper grooves or beads require thicker material that costs more to ship. The Nickle Gap has been called “Modern Farmhouse” however it will fit into any modern architecture if applied properly. The reason it’s called Nickel Gap is that in the past, the spacing was equal to putting three stacked nickels into the gap, the gap is perfectly square and has sharp, square edges. The square edges make it a modern take on old world siding. Nickel Gap can be installed Horizontally or Vertically depending on your preference. When finished, the shadow created by the Gap is what defines this style once installed. Regardless of the Gap spacing at 6,8, 10, or 12 inches, the gap will remain the same, approximately ¼”. Once installed both the shiplap and tongue & groove versions look the same. All our Sheet and Plank products can be installed both Vertically or Horizontally. A Horizontal installation is used when you want to make a room look expansive and modern. Horizontal installations can really expand a room and make it seem larger than it is. If you really want an uber modern look, cover the room in horizontal planks and paint it in a high gloss white. If you want a more rustic feel, use a matte paint. Vertical Installation is more contemporary and is what most people think about when they think of Beadboard or planks. This type of installation is best for making a room look taller as the vertical lines draw the eyes up. One additional thing to take note of is that the Nickel Gap looks best when installed Horizontally and the V Groove and Bead Board look best when installed Vertically on walls.